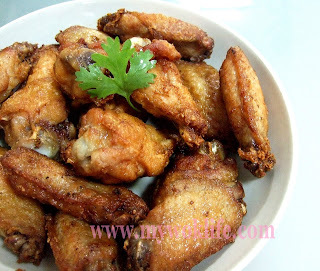 1) Wash chicken wings with salt water. Halves the wings at joints. Discard wing tips, or keep it, as desired. 2) Place wings in bowl, add in oyster sauce, rice wine and crushed chicken stock cubes. Combine well. Dredge each wing with seasoning mixture, using hand (to ensure whole wing is well covered with the seasoning). 3) Cover wings in bowl with cling wrap, and marinate in refrigerator for at least 4 hours, or overnight, like I did. 4) Drizzle cornstarch to briefly coat marinated wings. Heat wok with oil over high fire. When oil is hot, bring down heat to medium fire. Fry drumlets and mid-joints separately, for about 5 minutes each time, or until golden browned. 5) Remove wings from wok, and drain on kitchen towel. Serve. It took me less than 15 min to get the dish served (marinating time excluded). Each wing counts about 155 kcal. Remove the skin when eating chicken wing sounds silly, but I did so (laughing). It saves me more than half the calories intake of each wing. What to do? I love eating and yet conscious on weight controlling (winking smile). Tips: Do not crowd the wok. Fry no more than 8 pieces of either drumlets or mid-joints at one time. If whole wing, fry no more than 4 pieces at a time, depends on the size of your wok or electric deep fryer. *Use chilled chicken stock cube for easily crushed. *Use liquid-base concentrated chicken stock (2 tablespoons) instead of cube form, if preferred. *To save oil, I used shallow-frying (in wok) instead of deep frying method. Simply fry one side of the chicken, and then turn over to the other side. Fry both sides till well done. Oh ya, the first of your recipe that I’ll be trying will be the Szehuan Vege with Spare Ribs Soup…I hope I dun fail u, siifu! *lol* Will let u know! Have a great day ya! Yes, try it and do let me know again. I support you! I just don’t make them because I’m only cooking for myself at the moment. You’ll still be able to make just 1 portion chicken wings for yourself. Get the ready-package chicken wing of 3 to 4 pieces at supremarket.Use minimal amt of cornstarch to coat the wings or forgo it at all. 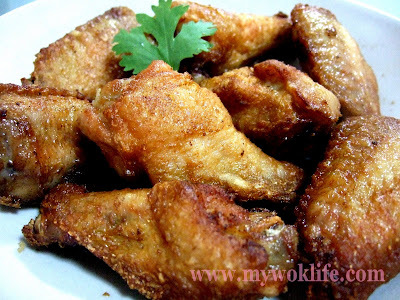 Then, you will be able to use pan-fry method (just use a little bit of oil) to cook the wings instead of deep or shallow frying which uses plenty of oil. As such, you may have your favourite food anytime! Hi! 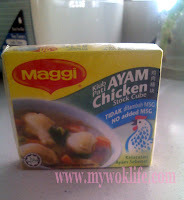 :) i tried out your recipe, i did not have the Maggi Chicken cube, but have the Knorr Chicken Seasoning Powder, and added 2 tablespoons of Knorr Chicken Seasoning Powder instead. 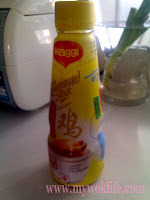 It turned out to be delicious but a little too salty for my taste…I am new to cooking, do you think i should reduce the Chicken Seasoning Powder or reduce the oyster sauce? Reduce the oyster sauce or less marinating time. It’s ok to use chicken granule. Any brand will do unless you can taste a lot of the differences btw brands. It’s ok to use either kind of flour or starch. I use cornstarch just to have a brief coating on the skin to have it lightly crisped, but I will use self raising flour to coat the whole meat properly if I do want my fried chicken to be crisped thickly. However, the effect has no much difference, except some said it is more crispy to use self raising flour. Hi!! I am Crystal, I was the one that asked the previous question…thank you for your reply!! i tried reducing the oyster sauce by half, and it was delicious!!! May I ask also, for time constraint, is it okay to marinate a batch of chicken wings, then freeze it in the freezer after marinating, so that it can be easily thawed and fried anytime? do you know if that is possible please? and if yes, do i still marinate the chicken overnight first, then throw it in the freezer, or throw it directly into the freezer after marinating? Buy fresh chicken wings instead if thawed frozen pieces, ok? Marinate at least few hours before freezing.